My oldest grandson asked, "Grandpa, what is your religion?" Thinking deeply, deciding to be honest, I said, "My religion is love; which is what great religions teach -- love." Then he said, "So which one is your religion?". Out of my mouth (and heart) came, "All of them, if they are about love." I also wanted to say that the great sages are humbled by the encounter with the mystery, the truth of that which cannot be spoken, of that union with the spirit known directly, while indescribable. That was too much to say; it says nothing anyway! Grandson wanted me to pick one religion, just like buying a car or computer. As if a religion is a consumer item. But, it is not my way. For thirty years, I studied, digested, and internalized many religions; finding all leading to the same place inside myself. That is my particular spiritual non-religious perspective on religion. Spirituality is very inner, very personal -- but as we share our spiritual lives we build common languages with terms, texts, rituals, and symbols which become religions. Religions naturally happen everywhere; they are spiritual support groups. Religion is totally useful, totally important. We especially need it for the great events of life: birth, puberty, marriage, and death. Problems begin when different religions each make claim to the exclusive franchise on truth and true worship. Then there is exclusion; and, suddenly a religion turns from love to judgement. Suddenly, it's either "us" or "them". Suddenly, there is reason to judge and fight. The love, compassion, and understanding at the root of the spiritual founder's encounter with the divine is forgotten. The seeds of great religions are the personal, yet cosmic-devine, insights of great souls such Christ, Buddha, Krishna, Lao Tze, or Mohamed. These insights are life changing. Someone asks, "Master, what did you learn? How did you become like this?" Teachings are passed by words and deeds which are recorded in many ways. A body of religious dogma forms to carry the teachings, but also corrupts the spirit of the teachings by freezing them. Then, we become inauthentic by wanting to "look good" in the sight of others. Within a group of believers with a common language, there arises an inner experience created by the spell of the language. That freezes perspectives at a certain historical time and culture -- new historical changes in values and conditions are disallowed. Thus, we lose the "spirit of the law". The "letter" or "letters" of the law become more important than love. Again, the basic spiritual truth is love -- loving our friends, children, neighbors, co-workers and more. Christ, Buddha, Lao Tze, and Mohamed are among the spiritual geniuses who knew the truth of love. Religion takes these fundamental human relationships to promote love in the wider community or society. This is how such teachings get embodied in a wider society. When religion fails at love, it is worse than no religion at all. We have a form of "good" gang warfare in place that kills for reasons of love, and falls victim to the whims of madman and power grabbers. In each case, the "evil" ones are the others outside of our religion: the pagans, the heathens, the infidels, and skeptics. What did someone once say, "the road to hell is paved with good intentions?" All the world's major religions include some statement of what is called The Golden Rule in their primary ethical consideration. To do to others what we would have others do to us. Let’s go deeper and ask: “From where does the golden rule come?” I claim that it comes from a common root experience had all over the world in all ages. This is the experience of cosmic consciousness, which occurs in many different ways and circumstances. 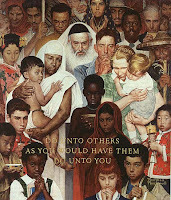 Check out: Versions of the Golden Rule in 21 World Religions. Image from Garden of Praise.